Did you love Dan Brown's The Lost Symbol? Are you fascinated by secret codes and deciphering lost history? 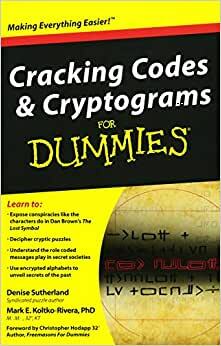 Cracking Codes and Cryptograms For Dummies shows you how to think like a symbologist to uncover mysteries and history by solving cryptograms and cracking codes that relate to Freemasonry, the Knights Templar, the Illuminati, and other secret societies and conspiracy theories. You'll get easy-to-follow instructions for solving everything from the simplest puzzles to fiendishly difficult ciphers using secret codes and lost symbols. With the helpful information in this friendly guide, you'll be unveiling mysteries and shedding light on history in no time! Start reading Cracking Codes and Cryptograms For Dummies on your Kindle in under a minute. Fascinated with the culture of conspiracy? Uncover the mysteries and test your knowledge of secret societies by solving cryptograms and deciphering codes that not only unveil historical fact and fiction but entertain you as well. Walk in the footsteps of a symbologist by solving everything from the simplest puzzles to fiendishly difficult ciphers, using secret codes and lost symbols. Denise Sutherland is a syndicated puzzle author. Her puzzles appear in a range of publications, including the Reader's Digest Mind Stretchers series, and she is the author of Word Searches For Dummies. Mark E. Koltko-Rivera, PhD, is a 32degree Freemason and expert on the major symbols and ceremonies of Freemasonry. Using this expertise, he analyzed prepublication clues to uncover and blog about key elements of The Lost Symbol. He co-hosts the weekly podcast Masonic Central. 2.0 out of 5 starsDisappointed. If you are looking for a book to teach you about cryptology, codes and ciphers. Look else where. If your looking for a book of puzzles you've found it. I got this book looking to help me understand codes and ciphers and the first 40 pages served as a fantastic intro. Then they throw you into 290ish pages of puzzles with minimal explanation. (40 pages to cover I believe 12ish different types of ciphers as you can imagine that makes for a pretty bare bones synopsis especially when you add in the pictures and the fact that this book isn't much bigger than your average paper back and uses large font and frequent headers ) almost 100 pages of this book are puzzles that basically just tell you guess what letters those other letters / numbers / symbols should be until you figure out the code. The only guide you get for these puzzles are things "q is always followed by u" and what the 12 most common letters at the beginning of English words are. Not that I don't appreciate the content to let me stretch my legs and try to crack some on my own. But the information provided / puzzle ratio is way too heavy one way. There's a few hint / answer chapters at the end that provide the absolute minimum in ways of answers. it would have been nice if it said "here's the answer. Now let's walk through how we figured this out. " even if that came at the cost of how many puzzles could be fit into this book. For such a fascinating and complex topic it seems a waste to only provide 40 pages of limited detail. Had this been in the $20 - $30 dollar range id have been very upset. But the $7 dollar price is the only thing that saves it from a 1 star review. I purchased this book looking to get something that would give me basic understanding of many different types of codes and cryptograms. But what I ended up with instead was more of a workbook made almost entirely of puzzles using various different cryptology methods. Out of 336 pages, there are exactly 37 pages on history and code descriptions. The rest of the book consists of puzzles that have to be figured out by using what was written in the first two chapters. If you are wanting something simply to add to your collection of sudoku and crossword books, you might enjoy this for a decent mental workout. But if your goal is to learn a little something about all the different codes that are out there, you may wish to look somewhere else. 43 people found this helpful. 3.0 out of 5 starsMore a book of puzzles to solve..
Based on the description I expected more in depth analysis of the solutions and instructions of how to solve cypher and codes. Instead I received another book of puzzles to solve. I was looking for something along the likes of "The Code Breakers" by David Kahn. To me this is not a great aid. Nothing against the book or Arthur, just not what I was expecting or looking for. just what I was looking for, many puzzles to keep me busy and has answers too. the beginning of the book shows you how the different types of cryptograms work.